This weekend marks two of the most momentous occasions of 2017. For most of the English-speaking world, it is a time for rushing out to dying retailers and buying scads of normally overpriced consumer goods, but for the more snobbish vestiges of the internet at large, it symbolizes the arrival of the tenth international studio album by Björk (counting Selmasongs). Having refrained from listening to the Utopia leak, I must admit that Björk’s public activities have put a bit of a damper on my expectations, seeing as she first contributed an older song off Post to the benefit vinyl “7 Inches For Planned Parenthood”, which is basically tantamount to gloating over homicide, then joined the trite coming-out party on social media for sexual harassment enablers and faux victims. I’m not ashamed to report that allegations about the character of Lars Von Trier, withheld for 17 years and unsubstantiated, haven’t influenced my opinion of Dancer in the Dark. No matter my misgivings about the present-day Björk, I still can’t help being awestruck by her finer moments, and with Utopia garnering so much early attention, now seems like the perfect time for reflecting on her pre-shill discography. Coincidentally, 2017 also affords a reason to celebrate 20 years of her most acclaimed album, Homogenic, which didn’t exactly alter the mainstream of pop or electronica but certainly formed a landmark in its artistic cohesiveness. Now I’m far from the first to single Homogenic out for praise, and none of this explication should prove novel to those already versed in Björk. Most of my generation, however, isn’t versed in her at all, and it’s with the intention of initiating such people that I’ll hereby proceed to rehash what I assume is a lot of fairly common knowledge. I can’t remember the first Björk album that broke my indisposition towards her voice. As a freshman trying to develop a tolerance for some of the more eccentric artists commended by an older friend, I understandably enjoyed most of the singles from Debut, catchy as it is, and found most of her music from Medulla onward unbearable. Now I’ve reached such a plane of enlightenment that I can safely regard Medulla as her second-greatest album, but I had to learn how to like Homogenic first. In retrospect, Björk’s third album may do the most to ease in wary newcomers, who if nothing else can at least absorb themselves in its lush soundscapes. Homogenic’s overarching theme is the merging of the organic and the mechanical, a characteristic conveyed in its production, lyrics, and especially its music videos. For all the quaint, racially based hoopla raised last year over Beyonce’s “visual album” Lemonade, I think it bears mentioning that Björk and her collaborators were doing the same thing two decades ago, on a more cerebral and mesmerizing level. Consider the then-groundbreaking video for All Is Full of Love, which in its pristine white visuals clearly passes as a precursor to I, Robot and Ex Machina. The symbolism is a tad on the nose: two humanoid robots pining for connection consummate their mutual desire in a kiss, but Björk’s haunting overlaid vocals elevate the material above its simple, science-fiction foundation. The music videos for Hunter and Joga extend the technological tapestry of the album, distorting images of the natural, i.e. Icelandic landscapes and Björk’s head, into some hybrid reality by the virtue of computer graphics. Björk opens the record on a softly ascending, swirling beat that immediately presages a more complex album than Debut and Post, the latter of which blared into the listener’s consciousness with an aggressive trip-hop sound. Her singing first enters in the wind-like backing vocals, signifying that her voice itself is going to be a important instrument in defining the palette of Homogenic. On Hunter, Björk impresses on us a state of restless searching and detachment, which will pervade most of the songs to come. 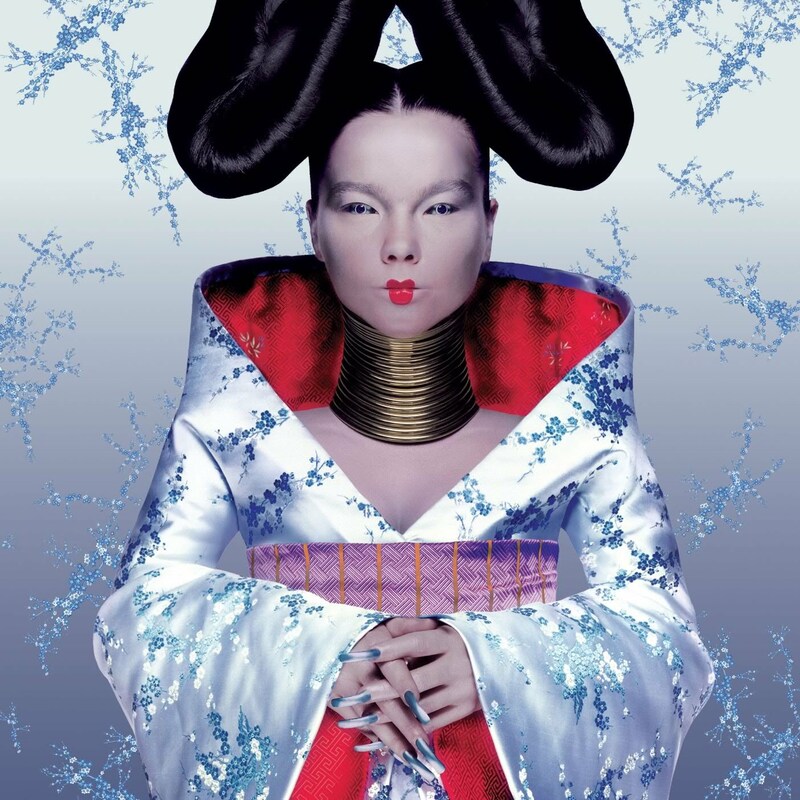 Homogenic defies easy comprehension as a concept album, but the majority of the tracks seem to be articulating vexation or regret over a distanced lover, making the parting, New Agey hymn All Is Full of Love that much more satisfying. Björk’s romantic depression manifests in conceits both poetic and tactile. “While you’re away / my heart comes undone / slowly unravels / in a ball of yarn,” she muses in an emotional, spacey song, the expressed favorite of Thom Yorke. The next song, written by Icelandic poet Sjōn, piles on the metaphors to a degree approaching glorious melodrama, and the music unabashedly follows suit. Björk fluctuates here between hushed appeals to a man who keeps leaving her in ruin and unrepressed wails on the outro. It’s rare to see predictable rhyme and meter observed so faithfully in her discography, yet Bachelorette nonetheless condenses all the pain that Björk has been feeling into several extraordinary couplets. You’re the one who walks me, I’m your one way street. On the instrumental side, foreboding piano keys and industrial programming crash against each other like violent waves, joined eventually by a swooning string section and accordion. Björk may not have got her feet wet on film scoring until three years later, but the musical peaks of Homogenic—Joga, Bachelorette, and All Is Full of Love—sound more like self-contained movies than anything else she’s recorded. But one should not infer from these that Homogenic is all intensity and gloom. Before long it applies its central strings-and-beats formula to tracks that range from reflective and monotonous (All Neon Like) to elated and buoyant (Alarm Call). On the latter of these, Björk revives a little of the dance flavor from her previous albums, all while reveling in her carefree emancipation: “It doesn’t scare me at all,” she repeatedly exults. The instrumentals here particularly highlight her and Mark Bell’s versatility with electronics. Whereas the textures in the first half of Homogenic were cold, at times cacophonous, in Alarm Call they seem to emulate the chirruping of birds. I didn’t initially favor the ninth track Pluto, which computerizes Björk’s voice for the first time and clatters along on a frigid, electronic drum pattern, but now I’m convinced that the whole wouldn’t function quite as well without it. More than just a breakup lament or a dubiously prescient enactment of the artificial supplanting the natural, Homogenic works because of its meticulous balancing of contrasts, and if I never had to suffer the artist’s theatrical, warped moaning on Pluto, then the ending surely wouldn’t fill me with such bliss. Björk has created one of a select few ironclad records that I sincerely believe would enrich the state of western culture if every person listened to it once, and preferably twice. Some people will no doubt find Björk’s vocal styling unpleasant and shrill, as if they’re being musically assaulted, and to these people I can say, “Me too, I’ve been there.” But if Danish film directors have taught us anything, sometimes you have to put up with a little discomfort to reap the best rewards.